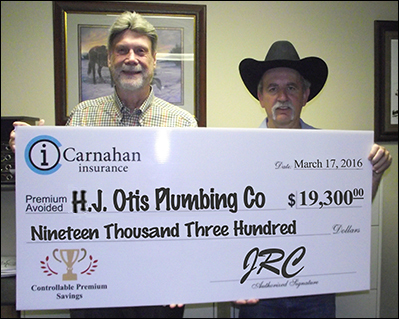 Carnahan Insurance announces the Controllable Premium award has been awarded to H.J. Otis Plumbing Company. Located in San Antonio, H.J. Otis has been in business since 1988, and is a leading regional provider of plumbing services. H. J. Otis was chosen for their steadily increasing worker’s comp premium savings. Though their 2014 savings were modest, in 2015, the company saved over $9,100 and they are on track to save a whopping $19,300 in 2016!